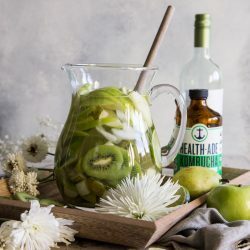 One pitcher, lots of fruit and a dose of kombucha make this power greens kombucha sangria a whole hell of a lot of fun, and boardline healthy! I’m not much one for shamrocks and Guinness, but give me a cocktail with some friends and I am all in. But, just because I am not going to be running through the streets in all green, with a faux leprechaun hat and tacky shades on, doesn’t mean I’m going to go all Scrooge on St. Patricks’ Day. I’m just enjoying it with a little more class, a little less in-your-face-technicolor-green and some healthy kombucha. 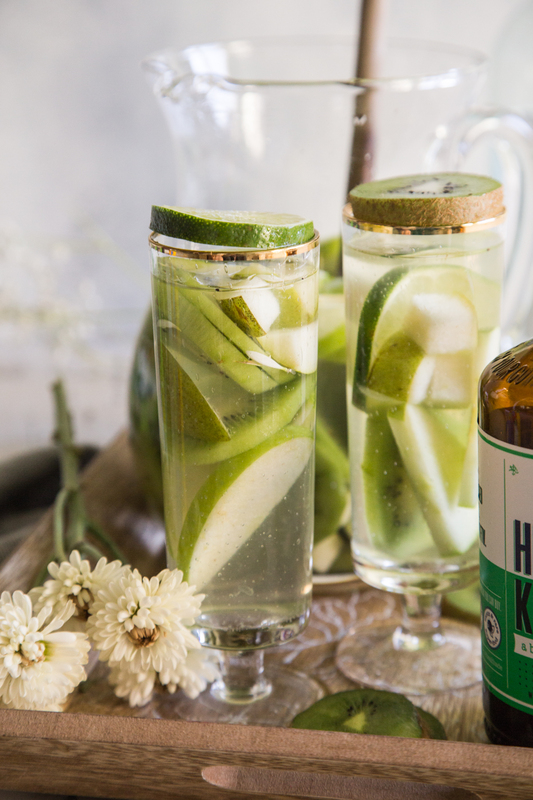 Pour one out for St. Pat with this kombucha sangria! 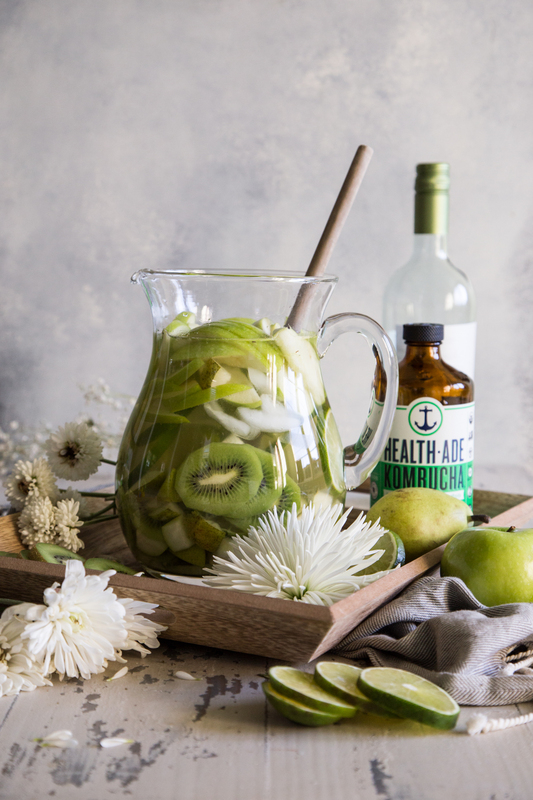 This Health-Ade Power Greens kombucha sangria is going to wow your guests and will go perfectly with a spread of green treats for your St. Patrick’s Day celebrations. Its simple ingredients make it easy to drink, and the boozy fruit at the end make this practically a snack! 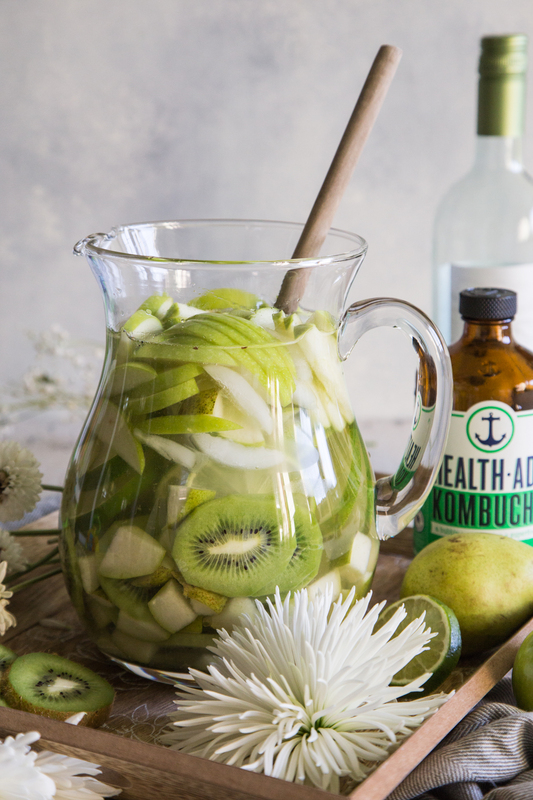 Load your pitcher up with every green fruit you can think of, add in your favorite sweet white wine, a bottle of Health-Ade Power Greens kombucha with its blend of super foods, wheatgrass, spirulina, and camu camu, and some vodka for extra punch and you’re off singing Molly Malone. 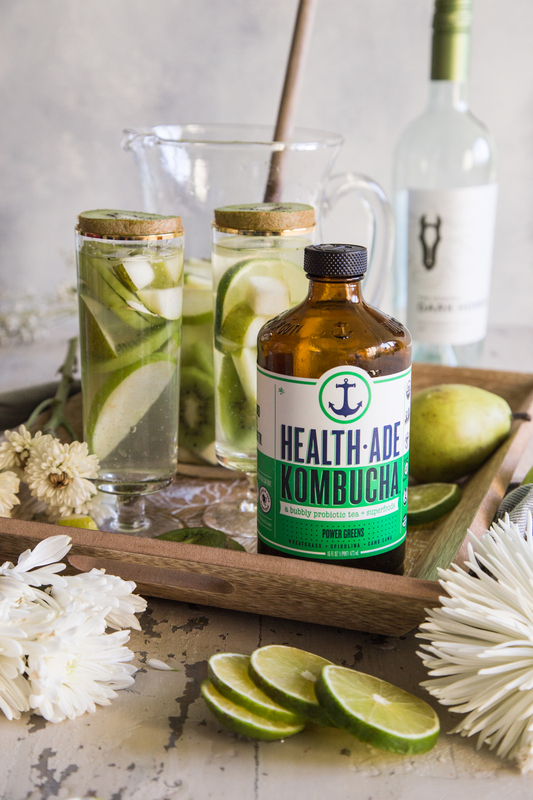 In a large pitcher, stir together the Health-Ade Power Greens Kombucha, wine, and vodka. Add in the sliced fruit and stir to combine. Place in the fridge to chill. Add ice before serving, if desired, but do not add too far in advance as it will melt and water down the sangria. Stir just prior to serving. Pour into glasses. *Fine print* This recipe is sponsored by Health-Ade as part of an ongoing partnership. All opinions are my own!